We all know very well that last year, the tech giant Google already confirmed that Hangouts would be divided into two different applications, focusing on the opportunities offered by the market for “professionals”. Hence, according to the latest reports, recently, the tech giant Google just launched a new chat application. 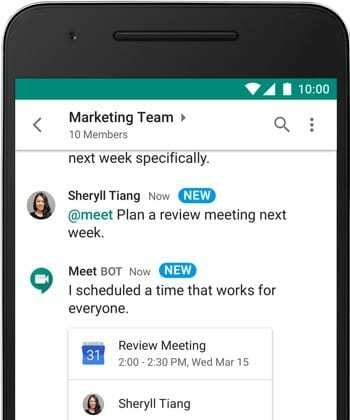 Last year, the tech giant Google already confirmed that Hangouts would be divided into two different applications, focusing on the opportunities offered by the market for “professionals”. Now, this bet materializes and as a result, the tech giant Google launched Hangouts Chat, a messaging client that arrives to compete directly with Slack and Microsoft Teams. The first thing we should know about Hangouts Chat is that it is exclusive to G Suite users, meaning it is only available for company profiles. We remind you that this new application is completely separate from Hangouts. Like Slack, in Hangouts Chat we can create channels in which we can talk with other co-workers. Each of these virtual rooms has a limit of 8,000 users and is currently compatible with 28 different languages. We can access Hangouts Chat through a web version and the applications for iOS, Android, macOS and Windows. As in Google Allo, Hangouts Chat includes bots (a total of 25) with which we can talk, and you can ask for certain Google Drive files or consult how we have the calendar. Developers can create their own bots and include them in this platform. As we can see, the tech giant Google is still working to integrate all its knowledge in artificial intelligence in its messaging applications. The bet with Hangouts Chat is to help professionals close meetings, find files and “much more”. If we want to use Hangouts Chat, we will have to choose between three packages: Basic, Business and Enterprise (5, 10 and 25 dollars per user per month, respectively). There are 14 days of free trial, in case we want to try it before deciding to pay. As always, there is an offer if we pay the full year and the most expensive packages offer more features than the basic one. The tech giant Google is famous for launching many messaging applications, which in some cases come to compete with each other. We will have to wait to see how the reception of this new initiative is, and if it will be able to compete with alternatives as established as Slack.